If you like curves, Samsung has got you covered. 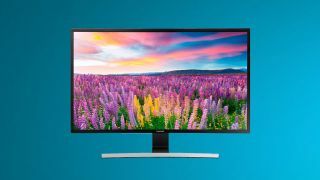 The South Korean technology manufacturer has unveiled three full HD curved monitors to add to their existing lineup of desktop displays. Monitor and TV manufacturers have touted curved screens as providing more immersive viewing experiences. They are designed to offer you multiple vantage points, some of which are physically closer along the edges, in order to make you feel as if you're surrounded by video and images. Samsung's new lineup hopes to offer this experience on smaller devices than the curved TVs you're traditionally accustomed to seeing. The new lineup features the SE590C, a 31.5-inch monitor with a black frame. The SE590C offers a 3000mm curve radius and a 5000:1 contrast ratio. It features two HDMI inputs, a display port, but no VGA. It will cost $599.99 (£385.24, AU$738.45). The lower end SE591C is 27 inches wide, built into a white frame. It will cost $399.99 (£329.99, AU$496). The bottom-of-the-line SE510C is available in a 23.6-inch or 27-inch model with a black frame. It will cost $299.99 (£199, AU$370). Both the SE591C and SE510C feature 4000mm curve radius, 3000:1 aspect ratios, one VGA and one HDMI port. The SE510C will not come with display ports. Each of the new monitors will offer 4ms refresh rates. Samsung remains among the leaders in display innovation. The Samsung UD970 ($1,999.99, £1,200 or AU$2,150) is a 31.5-inch 4K desktop monitor that is among the best displays for home and small office use. The company's 28-inch UD590 ($679, £429, AUS$782) is an incredibly affordable 4K monitor ($679, or AUS$782), aimed at gamers, media consumers and productivity-conscious users. Unfortunately, we weren't impressed with our initial interactions with Samsung curved devices. We found the 27-inch curved LED SD590CS ($429.99, £278.26, AU$548.83), to be gorgeously designed and easy to use, but much too expensive for a full HD device. We had a similar reaction to the 27-inch Samsung Ativ One 7 ($1,299, £1,129, AU$1,449), a desktop PC with a full HD curved screen that didn't add much to the overall viewing experience. What are the best monitors on the market today?